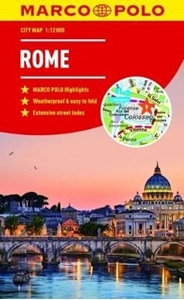 Rome Marco Polo City Map 2018: the ideal map for your trip. Let the Marco Polo city map of Rome guide you around this awe-inspiring city. Highly durable and waterproof, this handy, pocket-size Rome map folds away easily and is always on standby to help when you're stuck. Laminated finish - it feels like paper but it's waterproof, durable and tear-resistant! This hard-wearing, little pocket map of Rome will withstand lots of folding and refolding. Pocket size - the handy, light-weight, pocket-size format contains huge coverage of Rome. Easy to use - the super clear mapping in strong colours and clear text will help you navigate the city like a local. Marco Polo Highlights are now included - the Top Ten sights are featured with a brief description and are marked on the map to help you get more from your trip. Suggested tours - two inspirational itineraries are included, offering you ideas of what to see and how to plan your day. Public transport maps - the centre of Rome is easy to navigate on foot - but to enjoy all this city has to offer (and if your feet have had enough!) then look no further than the easy reference Rome transport map. Detailed scale - the scale is 1 : 12 000 showing you even the smallest of streets. Shopping destinations, coffee shops, bars, restaurants and tourist information, are also listed and cross-referenced. Ideal for short break, fly-drive and package holidays. Extensive street index - perfect to help you find your destination easily and quickly. Extended coverage - ideal for exploring slightly further afield. Trust Marco Polo's clear mapping and thorough street index to guide you around the wonderful city of Rome.